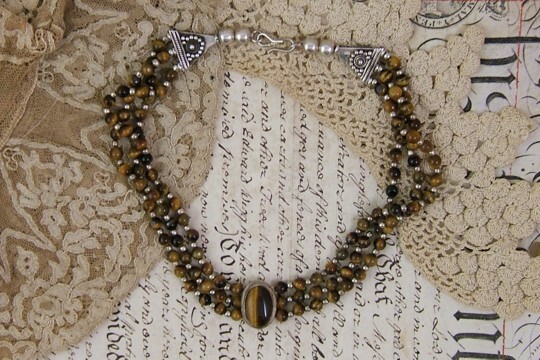 Three wonderful strands of tiger's eye and sterling silver beads are strung together. The centerpiece is a 12mm by 20 mm tiger's eye polished stone set in a deep sterling silver bezel setting. 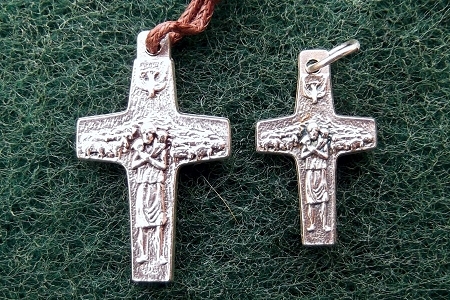 The clasp detail is so beautiful, the it would look lovely in front as well. This is a 13-1/2 inch choker. This makes the central stone sit nicely on the neck. For a larger size, you can use an extender or even a velvet ribbon. We photographed the necklace so that you might see the entire piece rather than show it on a model. You can rest assured that the strands lie flat. We just really wanted you to see the gorgeous clasp. This is a special find and we only have a few.